One program I have been working with for a long time is Jarte. This has turned out to be an all around great program. I found out about it through one of my newsletters, but apparently it has been around for years. And it's FREE! MS Word seems to have become the standard for documents throughout the corporate and personal world. This program will open and save MS Word document files (.doc extension) and others. If a file is composed with this program and saved as a .doc, MS Word will open it like it was made with that program. Interchangable is the word (pun intended). In addition Jarte will open and save text files, and it will do links. Files can be exported to htm or PDF as well. Rather than duplicate all the features and benefits here you can check the details on Jarte's site. It is a small program that loads fast without any bloat and does most anythng a writer would want to do. It doesn't have all the bells and whistles, that's why it's called a word processor, but it will do the normal things anyone would want to do in the writing world. 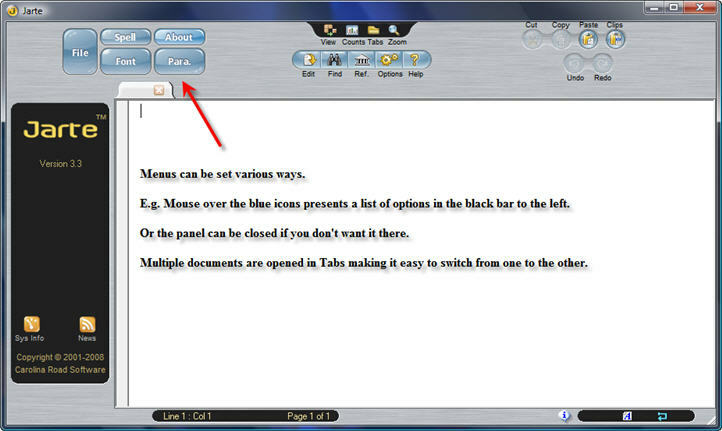 One more worthy mention, if you open two or more documents at the same time, they open in tabs and you can switch from one document to the other by selecting the tab just like in Firefox. Very efficient and user friendly. Jarte is now up to Version 3.3 which has a nicer interface and some other added goodies.